ELiA’s team aims at developing interdisciplinary research projects at the interface between Micro/Nanotechnologies, biology, biophysics and medical applications. 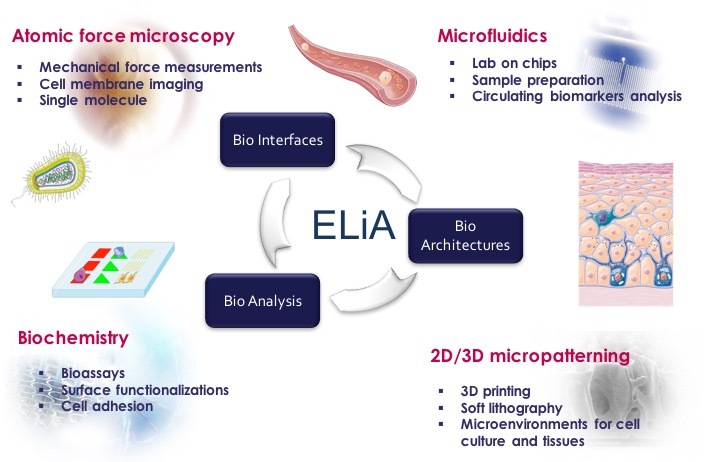 ELiA develops cutting edge technologies for the study and fabrication of: Bio-interfaces, 2D/3D biomolecular and cellular achitectures, and analytical devices. Applications target the study of sub-cellular mechanisms, the development of microdevices for the detection and analysis of circulating biomarkers, as well as the fabrication of cell microenvironments and tissue models. For more information visit the Research Topics webpage.